As a functioning adult, you know there’s something about debt that you’re supposed to understand at this point in your life, right? Something about not having too much, or maybe not too much in relation to something else… but frankly, this stuff is kind of confusing and some days you’d just rather take your Visa, buy a pizza, have a massage and then take a nap. Today, though, you’re on a quest. You’ve decided it’s time to stop renting and become a homeowner. You came here to get some really good information on how to do just that… so, let’s put the credit card away and talk about your debt to income ratio and why it matters to your future mortgage. If you’re not familiar with the term, don’t be shy, it’s one of the most common questions that first time homebuyers have when applying for a mortgage. That’s because there aren’t a lot of places where it’s obvious that your debt to income ratio is being used to determine your ability to get credit. It’s sort of figured out behind the scenes and you’re none the wiser. At a very basic level, your debt to income ratio is simply what it sounds like, all your long term, semi-permanent debt compared to your current income. Usually your mortgage lender will do this as a monthly comparison to make it easy, but the ratio’s the same whether you compare month to month or year to year. If you have $1,200 a month in debt and $5,000 a month in income, that’s the same as if you had $14,400 in yearly debt and $60,000 in yearly income. Both come out to 24 percent, which is a pretty good debt to income ratio. But, of course, it can’t be that easy, can it. What’s Included in a Debt to Income Ratio? Things that are included in your debt to income ratio are secured loans like a car loan or a boat loan, which are sort of guaranteed by the property that you’ve borrowed the money to purchase; unsecured loans like credit cards and lines of credit; student loans and any debt you’ve co-signed. Let me repeat that last thing. Any debt you’ve cosigned is part of this figure. So, if you agreed to cosign a loan for your sister 20 years ago and she’s still paying on it, that’s still going to count against you, even though you’ve totally forgotten about it. If you’re on a joint account with your ex-husband, you’re still on the hook when it comes to debt to income. Things that aren’t included, that are almost always assumed to be, are items like your car insurance, your utility bills, your cable bills, subscriptions and so forth. Basically, if you can cancel the payment at will (whether or not there are serious consequences like having no lights or being able to watch Game of Thrones), it’s probably not going to be included on your credit report unless you fail to pay as agreed. While you’re at it, it might be a good idea to go ahead and get yourself a credit report from a reputable site like MyFICO.com, the Fair Isaac website, just so you can see what is actually reporting. 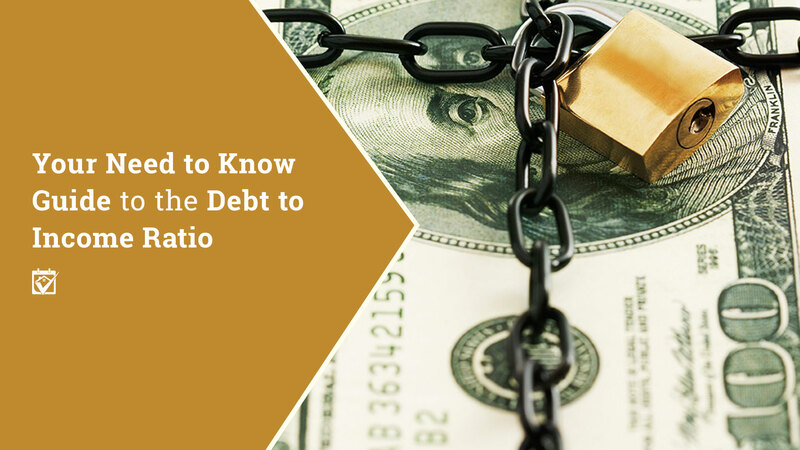 Figuring your debt to income ratio is pretty easy, the hardest part is figuring out what counts and what doesn’t. Just add up your monthly expenses and divide by your monthly gross income, before any taxes, insurance, 401k withdrawal and the like come out. There you go. That’s your debt to income ratio. Now we can do some stuff with it! There are three major programs that most home buyers utilize across most of the United States. These are the FHA, VA and Conventional mortgages. Each has its own requirements and debt to income ratio ceilings. Some are more complicated than others. 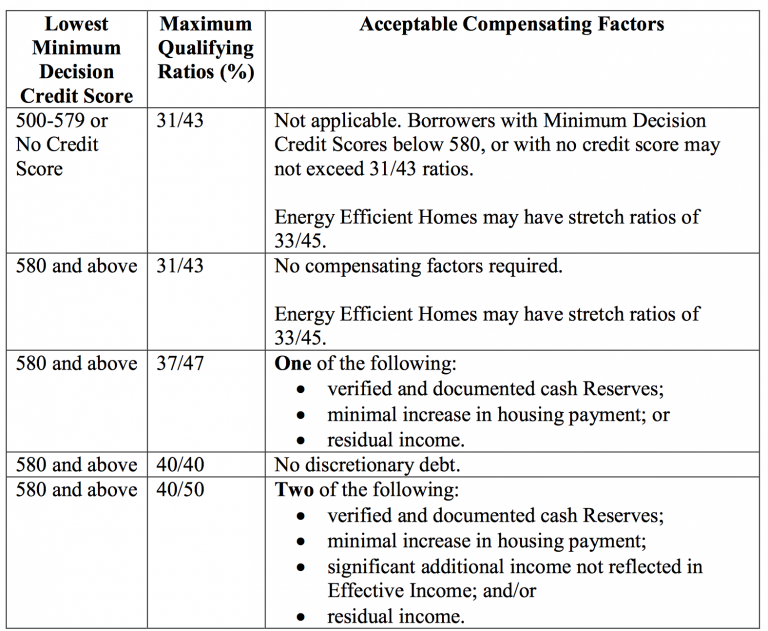 For FHA, there are two kinds of debt to income ratios to keep in mind. One is called the front-end ratio, the other is, unoriginally, named the back-end ratio. The front-end ratio is only your potential future housing debt; the back-end ratio includes all your debts. With that in mind, the chart below shows how you’d look to an FHA lender as of the writing of this blog. The first number in the column labeled “Maximum Qualifying Ratios (%)” is the front-end ratio, the second is the back-end ratio. Compensating factors can be thought of as other things you bring to the table to make you into a really awesome borrower. Since you have little to no experience at this mortgage thing, your FHA lender is understandably afraid of your eventually missing a payment in the 30 years you’re going to have a relationship, so they want evidence to show that you’re a stand-up kind of person. Conventional loans are a bit easier. Fannie Mae is the principal agency that guarantees what’s known as a “conventional” or “conforming” loan. Fannie has siblings like Freddie Mac and Ginnie Mae, but they’re at the movies right now and we’re not going to involve them in the conversation. For our purposes, conventional loans are all about Fannie Mae. In general, conventional loans tend to be more difficult to land, in part because they have more rigid income to debt requirements. For borrowers with credit scores of 680 or better and less than a 25 percent down payment, Fannie won’t allow more than a 36 percent debt to income ratio (but she only uses the one number, so at least it’s not more complicated than that). If your credit score is above 700 and your down payment is less than 25 of the home’s price, she’ll allow a 45 percent debt to income ratio. When it comes to Fannie, bringing more money to the table will absolutely catch her eye. She believes firmly that all things that glitter are definitely gold. That magic number is 25 percent of the sales price of your home. So, if you’re floating in cash, but have a higher debt to income ratio or a little bit lower credit score, you could win brownie points this way. If you’re a military vet and you’ve not used your VA mortgage benefits, you may be wondering about cashing in that particular chip. When it comes to the debt to income question, it’s a harder one to answer. Generally speaking, the VA wants to see a debt to income ratio below 41 percent, but like with other qualifiers under VA, the rules aren’t really all that hard and fast. VA loans tend to be a lot more flexible in general, and debt to income ratios are no exception. Although all the loans mentioned in this blog can be manually underwritten, the guidelines only allow for so much deviation outside the rules. VAs give a lot more wiggle room, so if you’re at a 45 percent debt to income ratio, for example, it might not be out of the question if everything else is in line. Figuring out your debt to income ratio is just one of the very first steps you should take on your path to getting a mortgage. Once you can see how much each of your debts affects your ability to get a home loan, you can either refinance those debts into loans with better terms or work extra hard to pay them down before approaching a mortgage lender.